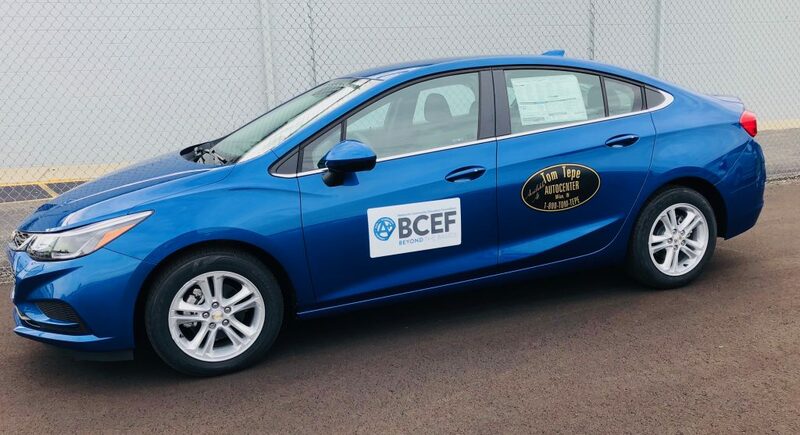 A new event hosted by BCEF will hopefully result in one lucky winner driving away in a 2018 “Bulldog blue” Chevrolet Cruze. For the first time ever, BCEF is holding a car raffle on October 28 at 4 PM at Batesville High School in cooperation with Tom Tepe Autocenter, to raise money for our programs. This new fundraiser was suggested by BCEF president Kim Kick. Vice president Jama Linkel-Cleghorn reached out to fellow alum Harry Tepe, BHS Class of 1998 and owner and president of Tom Tepe Autocenter in Milan, to see if he could support BCEF by helping coordinate the acquisition of a car to give away in a raffle. Tepe was immediately interested in giving back to the Batesville schools. A maximum of 750 tickets at a price of $100 each will be sold by the foundation. At least 500 tickets must be sold for the car to be awarded; otherwise, the raffle will automatically convert to a 50/50 cash raffle. The winner will be responsible for all withholding, taxes, title, and related fees. Official rules and regulations are posted on the BCEF website at BatesvilleEducationFoundation.org. Due to state law, raffle tickets may not be purchased online, however, they can be purchased from any of the thirteen BCEF board members, at the BCSC administration building from BCSC superintendent Paul Ketcham, or by downloading a form from the BCEF website and mailing it in with cash or a check made payable to BCEF. Purchasers, who must be at least 18 years old, will receive a confirmation of their order and their raffle ticket number. Only one name may be listed on each ticket. “The BCEF Car Raffle is exciting on many levels for me as a board member,” Linkel-Cleghorn shared. “It showcases our need for support in many types of ways. Of course, we are having the raffle to support the financial portion of our programs, but the partnership with Tom Tepe Autocenter highlights that we can work with business owners or individuals to support our programs in other ways, too. We are not only asking BCEF board members to help Batesville schools excel, we are asking community members to look beyond the basics and find a way to help BCEF. By highlighting the raffle partnership between BCEF and Tepe, BCEF hopes to encourage more BHS alumni to become aware about BCEF and support its efforts to expand learning for students in the classroom­­­—skills which they will take with them into the workforce. Those alumni who are in the area for Homecoming can watch for BCEF in the parade and at the football game.